Guest blog time! You might have encountered Dana Reinert at D.C. Fest or H Street. Or maybe you read about her when we blogged about designing the Coexist booth. She was instrumental in developing the nitro brew process, so we invited her to write about it. 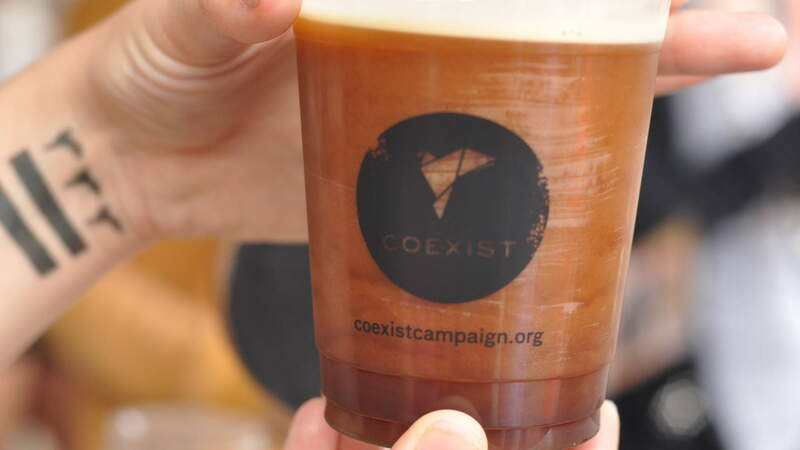 When we started thinking about bringing Coexist Coffee to our pop-up booths in September, we wondered if we should serve our coffee hot or cold. D.C., while lovely in the fall, is notoriously humid and muggy if the summer weather extends past August. Based on the weeks leading up to our game-time decision, we thought we needed something cooler to offer, both in temperature and in concept. Although enchanted by our hot coffee brewed in a Chemex (if you haven’t tried it, it’s delicious!) we were a little less than enthused at the idea of offering a regular iced coffee. We wanted better flavor than quickly brewing it hot would yield and didn’t want to be watering it down with excess ice to keep it cold. Plus, moving and storage would be cumbersome. Lance suggested something exciting: How about serving our coffee from a keg? That would be easier for serving and cleanup, not to mention it would be really awesome. We had a hypothesis: we could tap the coffee from a keg in the same way that you tap a stout beer. It would add a thickness to the brew and elevate the taste, and small amounts of carbonation would bring out a creamier mouth feel. I was on it. After a few hours of initial research, we didn’t know just how far we could take it, but at least we had an idea. The main question was whether we could get it ready in time for H Street. We were off and running. The next step was to develop a delicious Coexist cold brew. Casey (one of our valuable experts from Pivot Point Communications) suggested we use a Toddy, a container that allows you to cold brew in large batches. We started with two 5-gallon versions but quickly realized we needed to increase production, so we bought two more. With that, we got to work perfecting the concentrated brew to put in the kegs. Naushin over-caffeinated herself, grinding massive amounts of our whole beans to put in the Toddies (each required a 5-pound bag of Coexist Coffee). We then steeped the coffee grounds in cold water for 10-14 hours. We taste-tested an 8-hour batch, a 12-hour batch, and a 14-hour batch before deciding that a mixture would provide optimal flavor. My next job was to work the tap setup from a logistical angle. I jumped on the research: how was a nitro-brewed coffee tapped? How could we do it in an easy way and keep everything cold, sanitary, and really cool looking? How, exactly, would we push the coffee out of the keg? What would give it that extra edge? I decided to put together a festival tap, where the kegs could be hooked up to a nitrogen tank and regulator, run through a cooling system, and out of a stout faucet to give it the cascading effect that many stouts have. On the liquid chemistry end, a bit of hair-raising last-minute testing (and a lot of keg-agitation on Lance’s part) developed into filling the kegs with coffee, introducing a N2/CO2 mixture, adding a little Coexist magic, and pushing it out through the lines with the same nitrogen and CO2 mixture that taps a Guinness. Delicious, creamy, and a complete hit at the H-Street Festival. For pictures of the brewing process, visit our gallery. We also have an H Street Festival gallery.